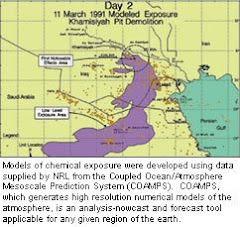 Editor's Note: Brain cancer has been measured in one study at twice the rate among Gulf War veterans exposed to the sarin and cyclosarin plume following U.S. detonation of an Iraqi munitions bunker at Khamisiyah, Iraq in March 1991 versus their non-exposed Gulf War veteran counterparts. A Gulf War veteran brain bank has been established by the federal VA at the recommendation of the federal Research Advisory Committee on Gulf War Veterans' Illnesses. However, the federal VA has yet to make information about it publicly available on the Internet. 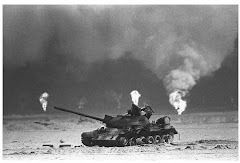 Gulf War veterans have been calling for publicly available data on Gulf War veterans' rates of serious diseases for many years. Written by Denise Richardson, Staff Writer, Oneonta (NY) Daily Star, July 15, 2009. (ONEONTA, NY) - A 1979 Oneonta High School graduate and Gulf War veteran had a bird's eye view of his hometown Tuesday from a helicopter. Gene Pier, 48, spent an hour flying _ and hovering _ in a Schweizer helicopter with pilot Pat Dillon, of Adirondack Helicopters. Relatives said they arranged the ride to fulfill a ``dying wish'' for Pier, who spoke of a desire to fly helicopters and operate a medical-evacuation service. Pier was diagnosed with a brain tumor in early 2007, they said, and he has had two surgeries and chemotherapy treatment. ``It's terminal, we're all sorry to say,'' said Lynn (Pier) Gibbs, his mother. At Oneonta Municipal Airport, about 10 family members listened for the chopper's sound, then watched as it approached the runway and rose again into the skies. Clouds drifted overhead as the wind blew, but the sunshine didn't yield. Pier joined the Marines after graduating from OHS, said his sister, Christine Andrews, a 1978 OHS graduate who lives in Harpersfield. He later joined the Army and trained as a helicopter pilot, she said. Pier, a chief warrant officer assigned to Fort Drum near Watertown, was seriously injured in a helicopter accident in Saudi Arabia on Feb. 7, 1991. Pier, who worked on an air ambulance, was among four soldiers hurt when the UH-1 Huey helicopter crashed on a noncombat mission. The pilot, Richard Lee, of Independence, Mo., was killed. Gordon said Pier received a Purple Heart after the crash, giving the medal to the pilot's widow. Pier's leg injury from the crash precluded him from flying helicopters, Andrews said. But he maintained a love of helicopters and flying, his family said. On Tuesday, he rode in Dillon's aircraft. Dillon said the Schweizer helicopter has two sets of controls, and Pier was able to share in the flying. Pier showed that he remembered his flying experience and did a good job with the controls, Dillon said. Pier explained ``the first takeoff was mine,'' and the pilots talked about the challenges posed by the wind. Pier said that from the air, he saw the clouds, mountains, the upper and lower reservoirs and Oneonta High School. Pier and Sonja, his wife of 11 years, live in South Carolina and arrived Friday for a visit. Sonja, who paid for the flight, found words difficult Tuesday afternoon, but smiled when asked about her first sight of him. His local relatives live in Oneonta and Harpersfield, and his mother lives in South Carolina. Pier has been an umpire at softball and volleyball games, and has been an advocate for children in an arbitration pretrial intervention program in Florence, S.C., family members said. Gordon said she arranged the helicopter ride with Dillon, who charged $300 and waived the $600 cost of flying the helicopter from Griffiss International Airport in Oneida County to Oneonta. ``He had no problems doing this for my brother,'' she said. Dillon said he understands the love of flying and was moved by Pier's story.